Two months after being elected president, Franklin Pierce was traveling with his wife and 11-year-old son when their train derailed in Massachusetts on January 6th, 1853. Pierce’s son Benjamin died in the crash, and he was the couple’s last surviving child. Mrs. Pierce reportedly believed that her son’s death was God’s way of punishing Mr. Pierce for seeking the presidency. Joan of Arc was punished for heresy by being burned at the stake when she was 19. Joan was born on this date in 1412. Skater Nancy Kerrigan asked “Why me?” after being clubbed in the knee by a stranger while training for the U.S. Figure Skating finals in Detroit on January 6th, 1994. After Kerrigan withdrew from the competition, rival Tonya Harding won the ladies’ title. But then, both were named to the U.S. Olympic team which would compete that winter in Norway, where Kerrigan would win a silver medal. Harding’s career was ruined when it turned out that her ex-husband and others had planned the attack on Kerrigan to help Tonya’s chances of getting to the Olympics. Kerrigan grew up in the Boston area. On this date in 1975, about two thousand Led Zeppelin fans trashed the Boston Garden arena while waiting to buy tickets to a Zeppelin show. The mayor of Boston punished those fans gone wild by banning Led Zeppelin from the city for five years. The band also boycotted the city on their own, and never played in Boston again. An American Airlines flight crashed in Queens, New York on November 12th, 2001, shortly after taking off from JFK Airport. More than 250 people were killed. It was the first major crash of a commercial airplane in the U.S. since the World Trade Center attack two months earlier, leading to concerns that it might be an act of terrorism. Even though pilot error was found to be the cause of the disaster, rumors spread that a terrorist did blow up the plane. A very unusual explosion took place on this date in 1970, in Florence, Oregon…after a whale beached itself there. The Oregon Highway Division was the agency in charge of the state’s beaches at the time, and highway staffers decided that the best way to dispose of the eight-ton whale carcass was to blow it up with half-a-ton of dynamite. The explosion, captured on film by a local TV station, blasted chunks of whale hundreds of feet from the carcass. An ice skating star was born in Oregon on the same day that whale blew up. Tonya Harding competed in women’s figure skating at the Winter Olympics of 1992 and 1994. The second time, Harding’s backers plotted to help her get to the Olympics by physically attacking her chief rival, Nancy Kerrigan, at the U.S. championships. Tonya got to the Olympics again, but the scheme blew up in their faces. Kerrigan recovered from her leg injury and won the Olympic silver medal, while Harding placed 8th. 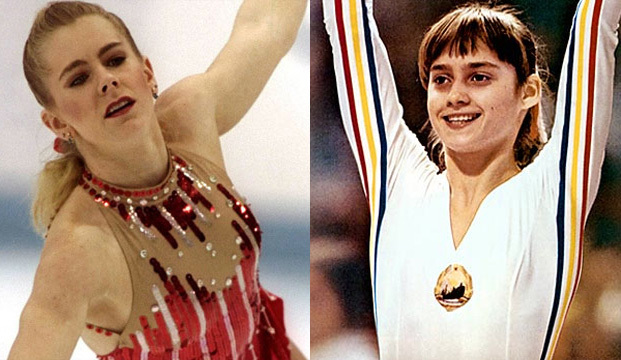 Harding shares her November 12th birthday with another Olympic athlete: Nadia Comaneci of Romania, born in 1961. Comaneci made history at the Montreal Games of 1976 by getting the first perfect score in Olympic women’s gymnastics. Author WilliamsProjectsPosted on November 12, 2018 November 8, 2018 Categories November, Today in history, TriviaTags airplane crash, American Airlines, beached whale, exploding whale, Florence Oregon, gymnastics, ice skating, JFK Airport, Montreal Olympics, Nadia Comaneci, Nancy Kerrigan, Oregon, Queens New York, Summer Olympics, Tonya Harding, whale carcass, Winter Olympics, women's gymnasticsLeave a comment on THAR SHE BLOWS!